This story is about four men who work in a confectionary. 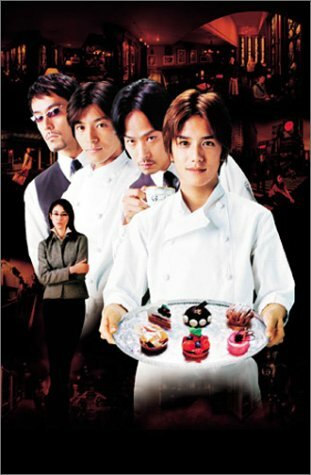 Tachibana Keiichiro (Kippei Shiina) is the owner; Ono Yusuke (Naohito Fujiki) is the superb baker that has a mysterious and mesmerizing aura; Kobayakawa Chikage (Hiroshi Abe) is the waiter and close bodyguard of Tachibana; and last but not least is Kanda Eiji (Hideaki Takizawa), the ex-boxer who loves cake so much that he becomes a waiter at 'Antique'. This is a refreshing, yet heartfelt comedy about the 4 very unique personalities that work until the wee hours of the night at the small confectionary. The series follows the romance, family life, and most importantly friendship that these 4 men from different generations experience. Based on manga series "Seiyo Kotto Yogashiten" by Fumi Yoshinaga (published from 1999 to 2002 magazine Wings). The Fuji TV drama version excised most of the gay aspects out from the manga & included new character "Itsuke Momoko" - a female sports journalist played by actress Koyuki. CtheWills Oct 05 2015 6:09 pm I like both the Korean version and the anime, and was hesitant at first to watch the Japanese version after watching the first episode I wasn’t sure Naohito Fujiki would make a convincing gay man. But in my desire to watch everything in my tastes that he has been in, I sat through it all the time waiting for him to make-out with at least one guy, but sadly it never happened; close, but no. This version alters many things outside of the character Ono’s sexuality. However, what bothered me most (lack of homoerotica in close second) was the text constantly popping up in the middle of the screen. I understand why it was done, however, a change in placement would have been nice, as well as letting the actors do their job instead of telling us what to think about their facial expressions. So overall, I wouldn’t say it sucked. It was fine for what it was, a feel good, chummy, light comedy.